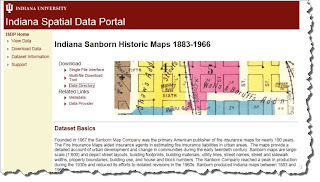 This project archives and distributes the Indiana Sanborn 1883-1966 Historic Maps via the Indiana Spatial Data Portal (ISDP). All 11,517 maps are available in both TIFF and PDF formats on Indiana University’s Scholarly Data Archive (SDA). The SDA is located at both Indiana University Bloomington and Indianapolis campuses, providing automatic off-site copies of data for disaster recovery. 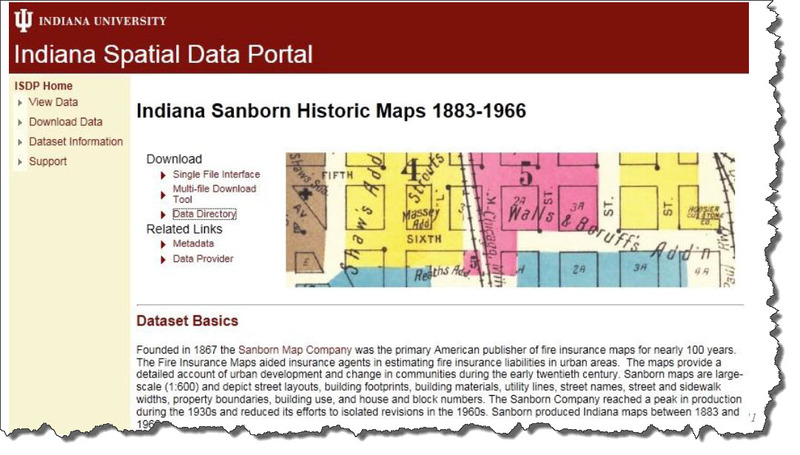 Both the larger TIFF and the smaller PDF Sanborn images are available for spatial discovery via the Indiana Spatial Data Portal (ISDP). The public domain Sanborn images (1883-1923) which represent 87% of the dataset are available for download. Users may contact the staff at IU’s Government Information Services to request copyright restricted images (1924 – 1966) once they discover the images they need via the ISDP interface.